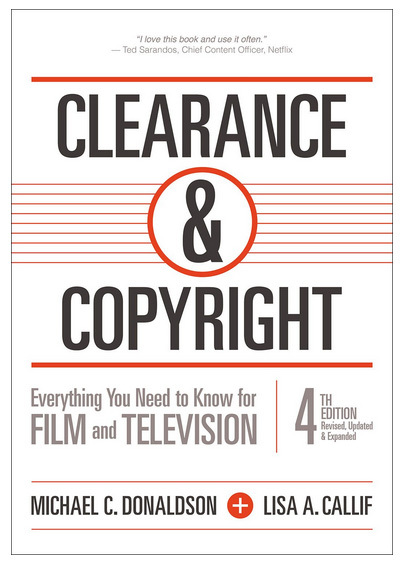 This book is the industry-standard book for every conceivable rights issue that filmmakers, videomakers, TV producers, and Internet content creators might encounter. It’s an invaluable reference which will keep you out of trouble and let you focus on the creative aspects of video and filmmaking. Read it once and then keep it on the shelf for reference and you will be way ahead of the game. The book includes links to 25 downloadable contracts and 50 illustrative film clips. Did you know that the famous documentary “Titicut Follies” by Frederic Wiseman was banned and that was the first time in the American film industry that a film was banned from general distribution. The film was banned because of a dispute about the releases Wiseman had obtained. The legal wrangling over this issue caused the film to finally be released to the public some 25 years later. The film influenced the closing of the Massachusetts mental institution featured in the film. And all the time Wiseman thought he had legal releases! Why take a chance with your film? Make sure you know the answers before any questions are asked. Fair Use is a term many filmmakers use to justify their right to use part of a copyrighted work. And yet, the laws on fair use can be murky at best. This book will help you understand once and for all fair use and how you should employ it. When used properly, this can allow you to use many archival clips that would otherwise be risky to copy. Attorney Donaldson has successfully negotiated with Media Professional Insurance Company and Chubb Insurance Company to offer fair use riders on the E&O insurance policies, allowing many films to be made under the fair use doctrine. “Clearance and Copyright” has three different approaches for documentary filmmakers to consider about “fair use” material. Filmmakers need to examine and choose one of these approaches BEFORE they start shooting. Owning this book is like having your own entertainment lawyer ready to answer every question you have, but without paying the the high fees. Understanding the copyright rules for film as well as clearances and other legal aspects will give your videos and films a much greater chance of success. Editor’s Note:I owned a previous edition of this book and refer to it often, but this new edition is so much better and more complete. I highly recommend this 4th edition. Meet the authors: Michael C. Donaldson is an LA entertainment lawyer with more than 45 years of experience in copyright and entertainment issues. Lisa A. Callif was named by The Daily Journal as one of the Top 100 Women Lawyers in California (2014). Her primary focus is on representing independent filmmakers.